Fair Juliet, the love of Romeo, was one of the famous star crossed lovers that Shakespeare wrote about! Now you can bring the romance into your home with this Beautiful Juliet Girls Juliet Costume! A rose by any other name would smell as sweet! Fair Juliet, the love of Romeo, was one of the famous star crossed lovers that Shakespeare wrote about! Now you can bring the romance into your home with this Beautiful Juliet Girls Juliet Costume! 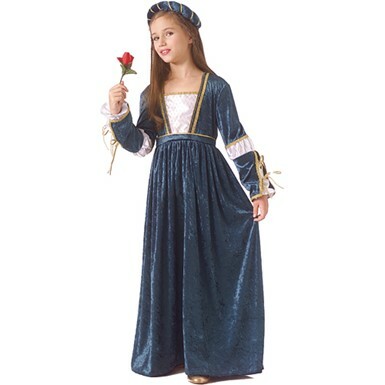 Our Beautiful Juliet Girls Juliet Costume comes with a lovely floor-length blue velvet gown! There are white inserts on the bodice and sleeves and gold trim on the dress! This also comes with a Renaissance-style headpiece made of blue velvet and gold trim! So order this costume today before you bid good morrow to your fair Prince!